Effective September 23rd, 2016 Traffic Management, Inc. purchased Tyrone Transportation, Inc. in an effort to consolidate services and continue providing great customer service to all of Tyrone Transportation’s customers. Traffic Management has been helping businesses move their freight in the Twin Cities for 20 years and has a great reputation as being a very customer service driven company. Tyrone Transportation is also know for their outstanding customer service for we are very excited to be working together. Traffic Management is a full service logistics company shipping a few boxes to full truckloads anywhere in the world. Your transportation partners helping you navigate through the world of shipping. We provide freight moving services to large and small businesses, including trucking, shipping, consulting, warehousing, distribution, and import/export. 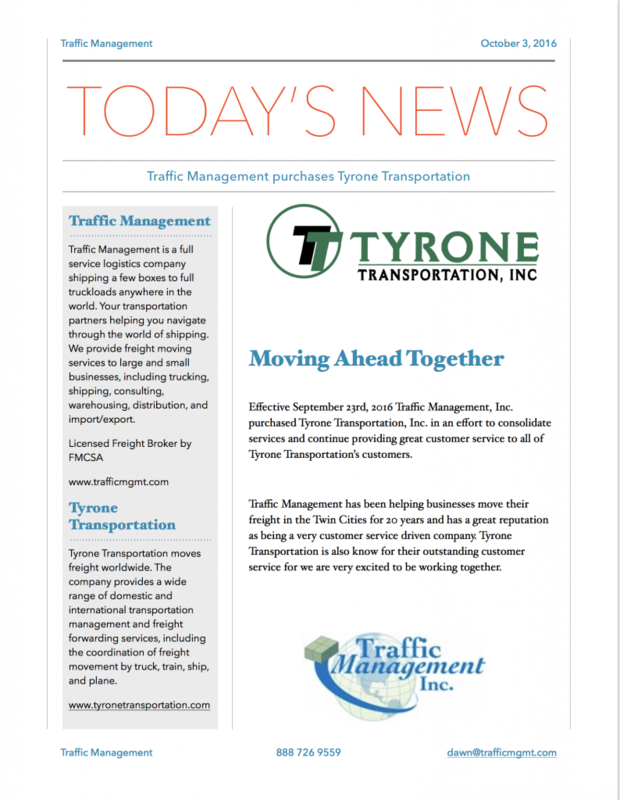 Tyrone Transportation moves freight worldwide. The company provides a wide range of domestic and international transportation management and freight forwarding services, including the coordination of freight movement by truck, train, ship, and plane.